Inspired by issues brought up in the 2016 U.S. presidential election, "Border City" is an architectural installation that proposes building a borderless city between the U.S. and Mexico. The proposal for "Border City" is built on a radially-expanding hexagonal grid to optimize distances and maximize efficiencies for urban planning. 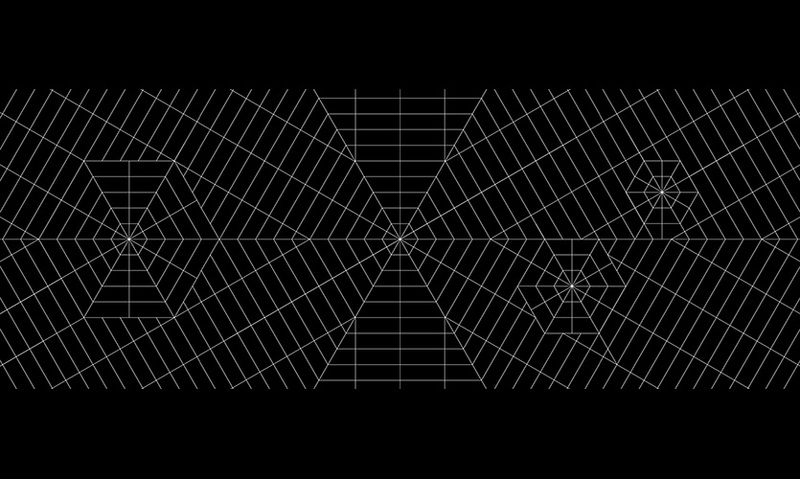 The grid also provides the basis for all graphics. A circular dimensional model of the prototype is displayed in the center of the rectangular gallery, which was built out with rounded corners. Animated inforgraphics fill the room from floor to ceiling with information about the Border City proposal, vividly illustrating the concepts, science and data behind the masterplan. Here, an infographic of global population growth fills the walls of the gallery and hexagonal shapes are used as units to represent this growth. The projections detail how the grid can provide a framework for land use, transportation and other factors that improve the quality of urban life. Here, a diagram of sustainability strategies. The infographics are designed to be quickly understood, presented in easily recognizable icons and symbols related to the subject. Here, a comparison of factors in Cuidad Juarez and El Paso is shown. The complete sequence of the presentation builds a conversation between the screens on the two long sides of the room and its overall cohesion supports the viability of the Border City vision. Building a wall between the U.S. and Mexico was a focal point of the 2016 U.S. presidential election; the idea has turned attention to the border between the two countries but ignores the point that they coexist in a complex synergy. Designed in collaboration with FR-EE / Fernando Romero Enterprise in response to the official theme, “Utopia by Design,” “Border City” is the Mexico installation at the first annual London Design Biennale. 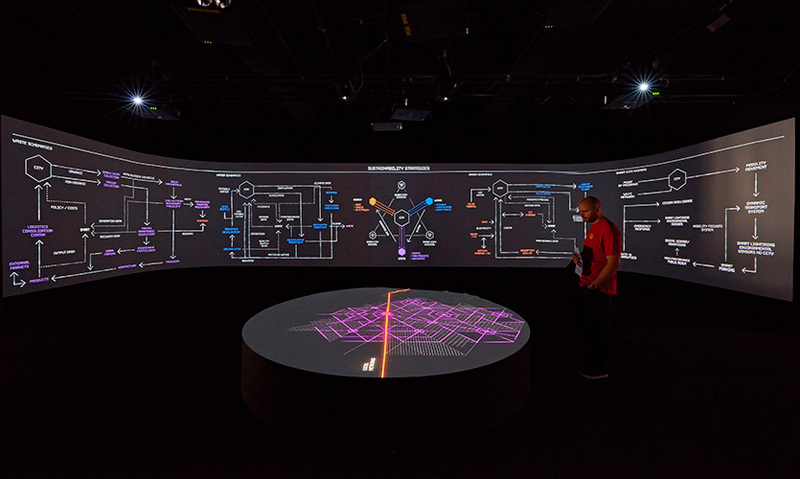 The installation design updates the concept of a cyclorama, an immersive panoramic image viewed from inside a cylindrical room. 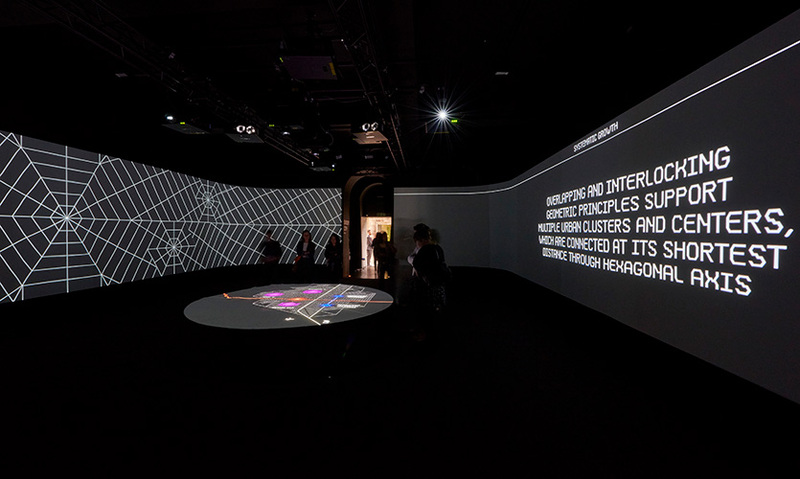 A circular dimensional model of the Border City prototype was displayed in the center of the rectangular gallery, which was built out with rounded corners. An animated projection on the model detailed how the adaptable hexagonal grid can provide a beneficial framework for land use, transportation, water systems, and other factors that improve the quality of urban life. 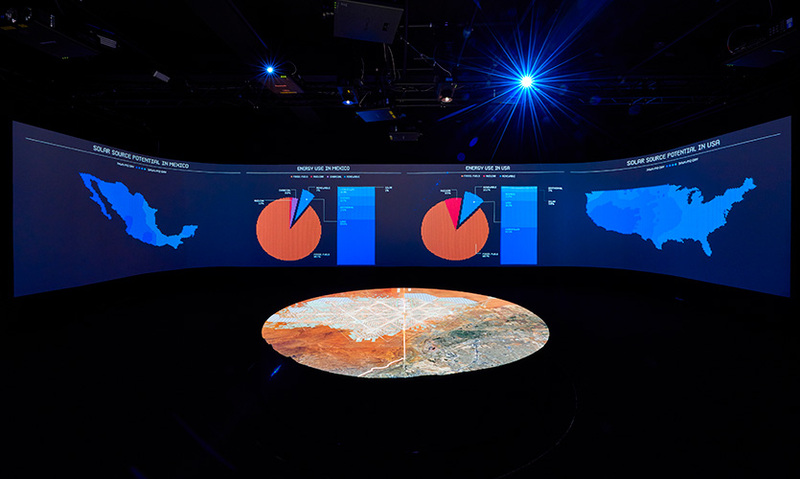 The idea was illustrated and amplified by the dynamic graphics projected on the walls, which wrapped around and filled the room from floor to ceiling and in 360 degrees with information about the Border City proposal and the region at large. 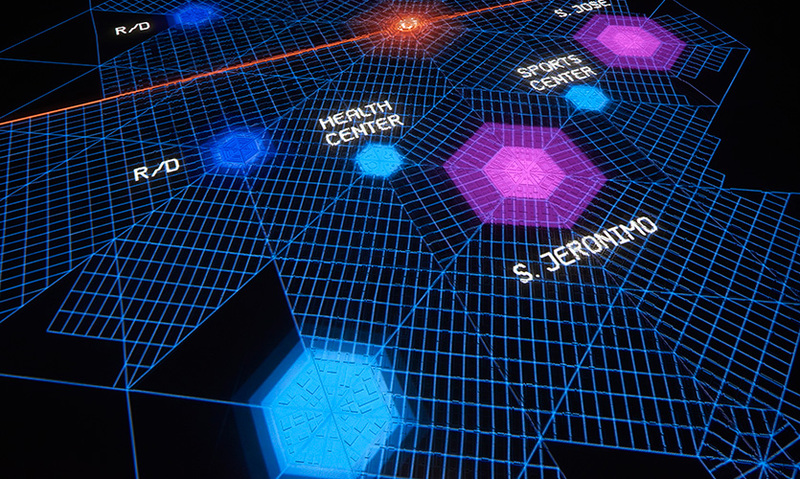 The graphics are also designed on a hexagonal grid. This extends to a custom typeface, Hex Grid, which features letterforms built around hexagonal geometry. The attention to detail helps create a cohesive experience of the prototype, demonstrating the viability of Romero’s vision. SuperUber collaborated on the animation and projection of the graphics. The designers worked with FR-EE to develop the narrative of the motion graphics and determine which information to highlight. The continuous sequence progresses from a global to a granular view, presenting data about the world’s mega-regions before focusing in on the U.S.-Mexico border, and Ciudád Juarez and El Paso in particular. The infographics create a powerful portrait of the region as told through pressing issues and topics, including overviews of immigration, urban growth, and slum populations, and comparisons of factors such as border crossings, access to healthcare, drug consumption, and crime statistics. Hexagonal shapes are used as units to represent populations in the charts and graphs and as the pixels that make up photographic images. 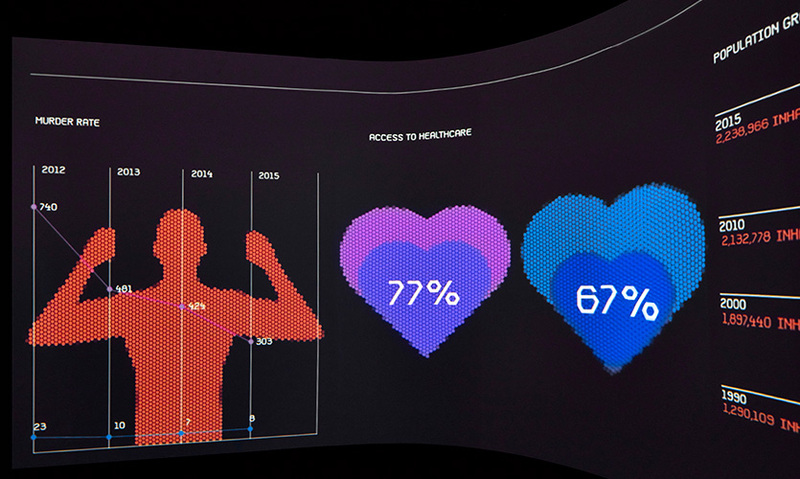 The infographics were designed to be quickly understood, taking on easily recognizable shapes of icons and symbols related to the subject at hand. The complete sequence makes the most of the all-around presentation, building a back-and-forth conversation between two screens on the long sides of the room. The greatest challenge for the design team was to take the astounding amount of data, distill it and prioritize its presentation. The format of the exhibition itself was challenging, too. The maximum amount of time visitors spend in spaces like these is about ten minutes—with a three-minute video as part of the installation, the designers had only seven minutes with which to communicate the complex concepts that comprise Border City. The exhibition was displayed for two weeks in London and was commended by the London Design Biennale Jury for its particular response to the 2016 Biennale’s utopian theme. Additionally, the event became a point of political conversation as Donald Trump had at that time had recently announced his proposition to build a wall at the border of Mexico—a sharp contrast to the borderless city the exhibition was proposing. "A beautifully optimistic premise underpins this exhibition. The graphics are bold and simple in their resolution resulting in a clear dissemination of the message." 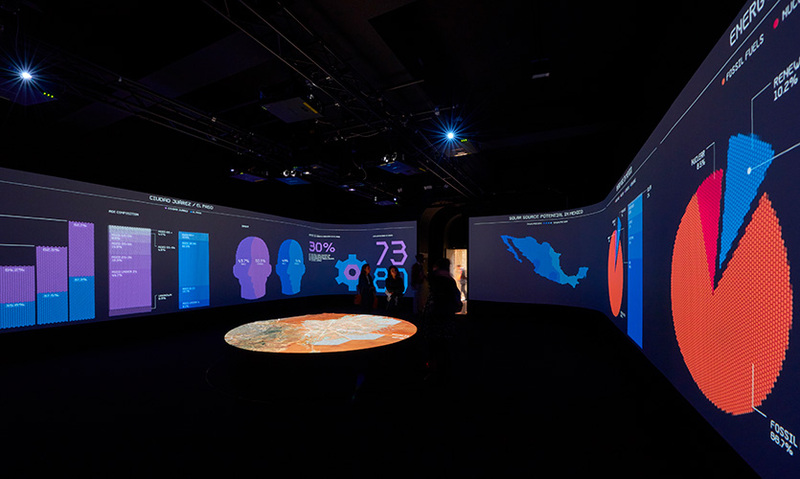 "An ethereal, embracing wall of projected infographics about immigration and the U.S. and Mexico border is honored at the same moment that a constructed wall is being considered to divide. A custom typeface, Hex Grid, and coordinated infographics are expertly grounded in geographical place by a media map. This is an example of smart digital questioning of an analog proposition." "The migration and safety of struggling people is a topic of great concern. 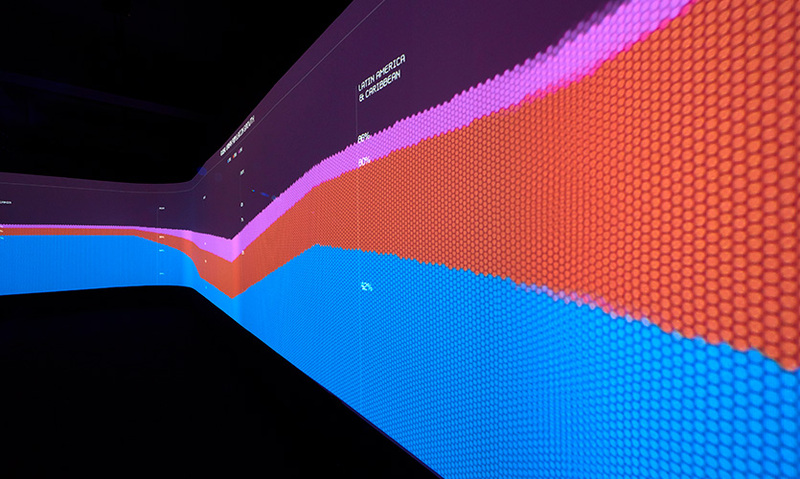 Regardless of which ideological side you stand on regarding border regulation, this digital exhibit uses motion, interaction and data visualization to display information on the topic. The hexagon shape and grid help anchor a consistent visual style."